This last article about the Timeline is sort of a bonus for those who want to know 'everything' about the timeline panel. The color codes can be a quick visual help to recognize object timelines, and I personally use the shortcut keys quite a lot to avoid the many mouse movements to the different tabs in the Properties panel. The color coding is the same for master slide timelines and slide timelines. The hexadecimal code is just an indication because a lot of the timelines have a gradient fill.. I love shortcut keys, once published my favorites for moving/resizing objects (which are still functional). The timeline panel has also several shortcut keys, which can save time because you don't have to switch to the Properties panel all the time. Some of the shortcut keys also work for Effect timelines, but not all. Zooming : Zooming in/out has to be done with the slider at the bottom of the Timeline panel. No shortcut keys are available. Spacebar or F3: alternative shortcuts for the play button on the timeline panel or the option Play Slide (confusingly stored under the big button Preview). This method (no Preview) can be used for editing timing, for synchronizing. Use this 'Play slide' (or scrub) to position the Playhead, and you can then easily synchronize start times of objects with this Playhead position. Inserting an object when the playhead is at a certain frame will result in having the object timeline starting with that frame. 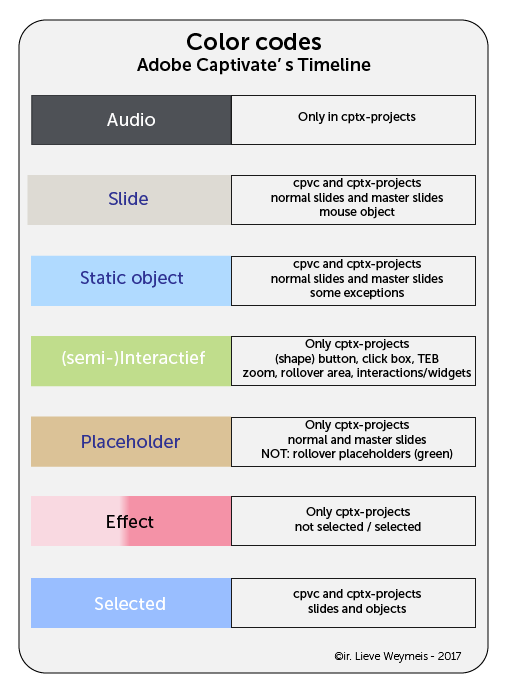 CTRL-E: to extend the duration of a selected object till the end of the slide. CTRL-LEFT/CTRL-RIGHT arrow: moves start of an object timeline 1sec in the indicated direction (also audio timelines), applied effect timelines will move along. SHIFT-LEFT/SHIFT-RIGHT arrow: decrements/increments duration of slide timeline or object timeline with 0,1sec. Applied effect timelines will not be changed. This means that an effect timeline could end up being outside of the object timeline; in that case the effects will play but not with the intended duration or start. SHIFT-CTRL-LEFT/SHIFT-CTRL-RIGHT: decrements/increments duration of slide timeline or object timeline with 1sec; same behavior for the effect timelines as described above. This was the last article in the (long?) sequence about Captivate's Timelines. I learned from the contacts with Captivate users, as forum moderator, trainer and consultant, that the Timeline is the most important stumbling block for starting Captivate users. For that reason I spent quite a lot of hours trying to assemble this 'soap' about it. Based about that same experience, and the statistics of my blog posts, I see two other similar issues causing problems to Captivate newbies. In the next article I will try to elaborate on those 'big' 3 and offer links to tutorials/articles that explain them in depth.